Our Total Security Concept can be best described as an “all inclusive” approach where every part of the company, every sub-process and every internal and external interface is examined from a security perspective. The three most important production principles in our Total Security Concept are “redundancy”, “control” and “physical separation”. In a modern society an interruption of supply of identity documents is unthinkable. It is our responsibility to avoid any process interruption under any circumstance. Therefore for every necessary facility we established a parallel structure – guaranteeing an interruption-free production. This approach is supported by a tight control system. OeSD established a 24/7 internal control and surveillance service, which is complemented by external control authorities. As part of a nation’s critical infrastructure OeSD is regularly audited by state authorities. E.g. the state control service of the Austrian Ministry of the Interior regularly visits and audits our premises with regards to the manufacturing and personalization of the Austrian ID documents. As the first security printing house worldwide, OeSD was awarded the highest possible rating of “High Security Printer” by International Confederation for Printing and Allied Industries (Intergraf). Annual audits guarantee full and complete compliance with regulations concerning all security-related processes and appropriate equipment and maintenance of all relevant facilities. 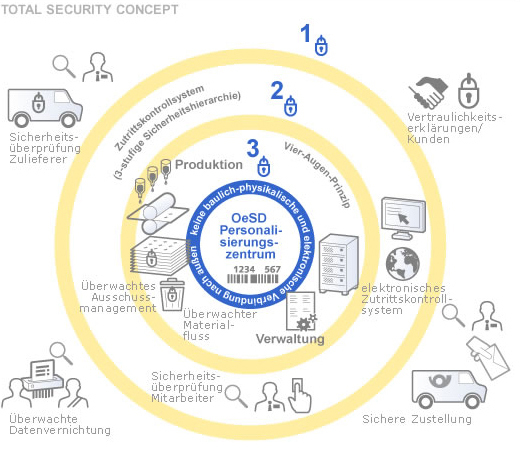 OQS – Austrian Association for the Certification of Quality and Management Systems awarded OeSD for its implementation and further improvement of an effective quality management system pursuant to the requirements of OeNORM ISO 9001:2008.